It is with some regret that I skip over Vegan MoFo this year. 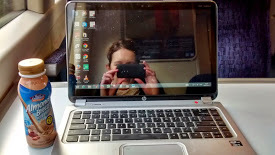 Unfortunately, September is a busy enough month for me without adding in extra blogging. I will focus on trying to keep up with others' posts instead, and hope to join in again next year. Whilst I am skipping Vegan Mofo, I am pleased to have an opportunity to participate in 'pasta please'. Johanna has just announced that she is hosting pasta please for September, with a focus on long pasta. This times rather brilliantly with today's post. This noodle dish makes use of another pack of beetroot pasta, as previously featured with a spinach and white bean sauce. Instead of green, this dish packs an assortment of colours. It also packs an assortment of flavours! Some of the inspiration for the sauce came from the cumin-infused vegetables and chickpeas recently featured on Fat Free Vegan. The rest came from the vegetables I had on hand, and a certain amount of making it up as I went along. Fortunately, the result was not only edible but enjoyable. I will confess to liking this more as leftovers than on the day I made it, but that may be because I was having an onion issue on the night in question. I have learnt that if I take my contact lenses out before I chop onions, I am far more sensitive to onion tears than if I do not. By 'far more sensitive', I mean 'sobbing in the kitchen and teary for at least an hour post onion chopping'. I should really extend that learning to never taking my contacts out before cooking. As it is, sometimes I do, and on this evening my enjoyment of the meal was tempered by still stinging eyes. Onion issues aside, this is a spaghetti dish that is nutrition filled and flavour packed. If you happen to have pink noodles on hand, I think it is also rather pretty! Inspired by cumin-infused vegetables and chickpeas on Fat Free Vegan. Soak the split peas for at least an hour, then rinse and cover with water in a saucepan. Bring to the boil, reduce heat and simmer covered for 1 hour. When the split peas are nearly cooked, saute the onion and garlic in a non-stick pan with the olive oil, until golden. Add the zucchini, pepper, carrot and herbs and cook over medium heat for 5 minutes, stirring occasionally. Reduce heat to low, add the tomatoes and cooked split peas, and allow to simmer for 15 minutes. Cook your pasta according to packet directions and then serve topped with the sauce. 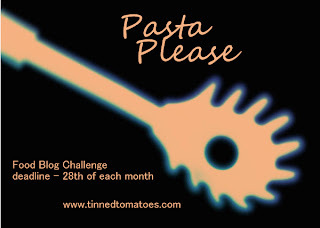 I am sending this to Johanna's pasta please round up for September, which she is hosting for Jacqueline of Tinned Tomatoes. Have you ever put cumin in a pasta sauce? I'm pretty sure this is the first time I have, but I rather liked it. Thanks for your entry Kari and for the tear shed to make it :-) I now wish I had contact lenses as onions often make me cry and it can be very painful - I saw a recipe calling for 12 onions recently - ouch! That's a really interesting pasta sauce - I am scratching my head to think if I have ever used cumin in a pasta sauce. Just not sure. But I am interested and love the idea of split peas too - and of course just love that coloured pasta. A recipe with 12 onions would definitely be dismissed by me! I can't believe other people go through the pain every time they cut onions! What an interesting sauce! I really love split peas but have never used them in a pasta sauce before - not sure about cumin either. I was a bit concerned about how it would turn out, given the flavours aren't things I'm used to mixing - but fortunately it seemed to come together! I recently switched to wearing glasses full time instead of contact lenses, and it has made dinner prep such a painful experience! Isn't it horrible?! Interesting to hear you've made the swap though - I sense one day I may do the same, if only because my eyes may tire of contacts. How are you finding it? If I ever move to full-time glasses, I think I'll definitely have to try swimming goggles! As it is, I'm going to try harder to keep my contact protection in, but chewing gum sounds like a back up plan too! I love beetroot pasta and this dish looks very comforting. That beet pasta is such a pretty pink! And I love the sound of that tomato sauce...smoky cumin flavor is always appealing to me. I am pretty obsessed with the beet pasta. I keep thinking of other things it would be good for...my latest idea is a chocolate mole sauce. Or just a straight up chocolate sweet sauce. Colour makes such a difference! I don't blame you for skipping out - September is a crazy month for sure. And that's interesting about the contacts/onions! I've noticed that before too (though not nearly to the same degree). Contacts are a badass shield from onion fumes. I love love everything about this pasta, so hearty and healthy. And let's not forget easy! I have never seen beetroot pasta before - sounds interesting!